The sister-in-law of the late game show host Leslie Crowther has been found dead next to her critically-injured husband. Leslie Crowther's brother Frank, aged in his 80s, was discovered with his dead wife Winifred, at their home in Sutton, south London, on Thursday. Mrs Crowther was pronounced dead at the scene. Mr Crowther is now in hospital with knife wounds. The Metropolitan Police said they were not looking for anyone else. "The victim has not yet been formally identified. "She was pronounced dead at the scene. "The post-mortem examination revealed she died of multiple stab wounds," said a Metropolitan Police spokesman. "A man in his 80s was also found unconscious at the scene. "He is in hospital in a critical condition." Mrs Crowther is believed to have been suffering from Alzheimer's disease. 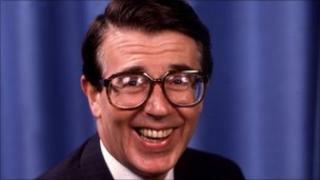 Leslie Crowther hosted The Price is Right and other television programmes. He died in 1996 aged 63.